Herbaceous perennial, woody stock, rhizomatous, up to 0.9 m high. 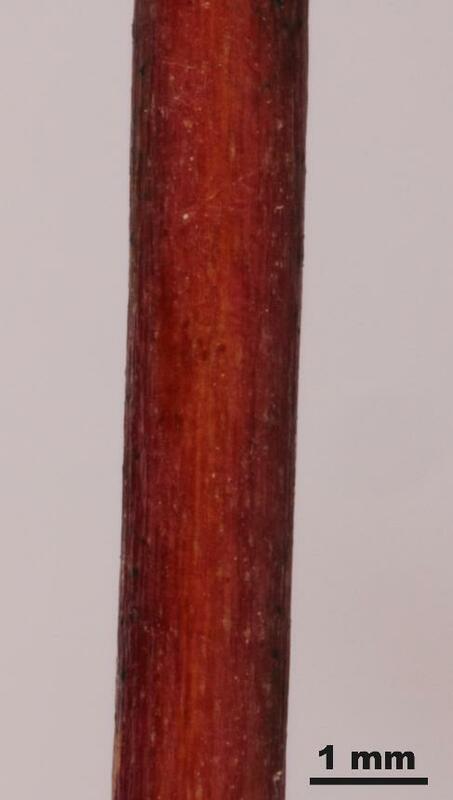 Stems erect, up to 1.8 mm diam., terete, without lines, black glands absent. Leaves 4.0–25.0 mm long, 4.0–20.0 mm wide, ovate or broadly elliptic, glabrous, reticulate tertiary veins absent; pellucid glands present; black glands absent; apex subacute, obtuse or rounded; margin entire; base obtuse, truncate or cordate; sessile. Inflorescence terminal, dichasial cymes usually in panicles, flowers 1–25, corolla 10.0–20.0 mm diam. Pedicels 7.0–14.0 mm long. Bracteoles 1.5–2.5 mm long, 0.5–1.3 mm wide, ovate, lanceolate or elliptic-ovate, apex subacute or obtuse. Sepals 5, 2.0–4.5 mm long, 1.0–2.5 mm wide, more or less equal, not accrescent, obovate, broadly elliptic or suborbicular; pellucid glands present, sometimes sparse or obscure; black glands present; apex obtuse or rounded; margin entire, black glands regularly spaced in upper ⅔. Petals 6.5–10.0 mm long, 3.2–4.0 mm wide, greater than sepals, broadly elliptic, ovate or elliptic-ovate, yellow, with a red tinge at anthesis, black glands present on upper ⅔, persistent after anthesis. Stamens mainly in 3 bundles, but often appearing in a ring, 29–42, 3.8–7.0 mm long; anthers 0.3–0.6 mm long, anther gland orange. Ovary 1.0–3.5 mm long, 1.5–2.2 mm wide, ovoid. Styles 3, 3.5–5.5 mm long, greater than or equal to ovary. 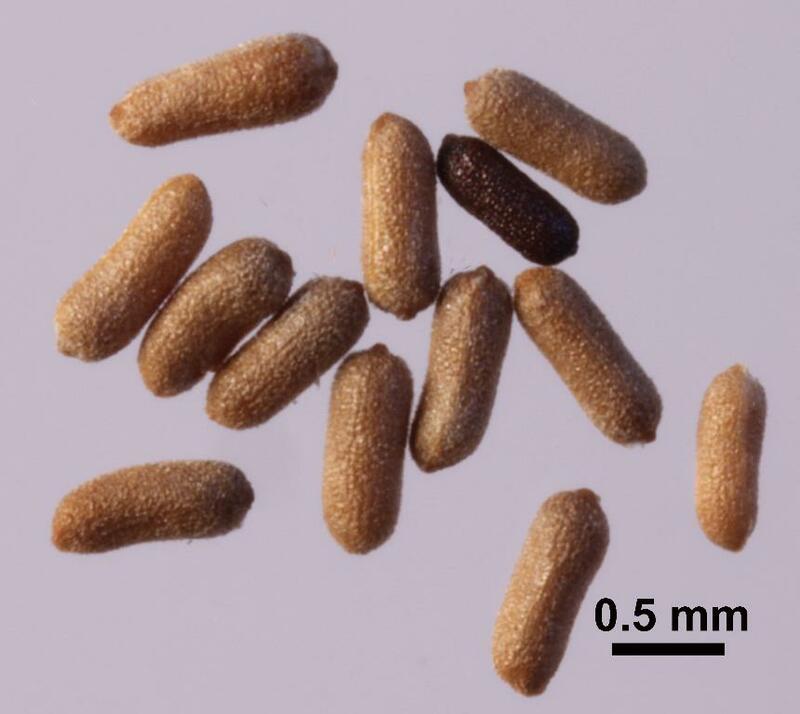 Fruit capsule, 5.0–7.0 mm long, 3.3–4.2 mm wide, ellipsoid-ovoid or broadly ellipsoid-ovoid, light brown. Seeds 1.0–1.2 mm long, c. 0.4 mm wide, oblong, terete, olive green, light yellow-brown, papillate, apices obtuse or rounded. Distinguished by the stems being terete and without lines, the leaves without black glands, the sepals being obovate, broadly elliptic or suborbicular with an obtuse or rounded apex and the margin with a fringe of black glands, and petals with a fringe of black glands. 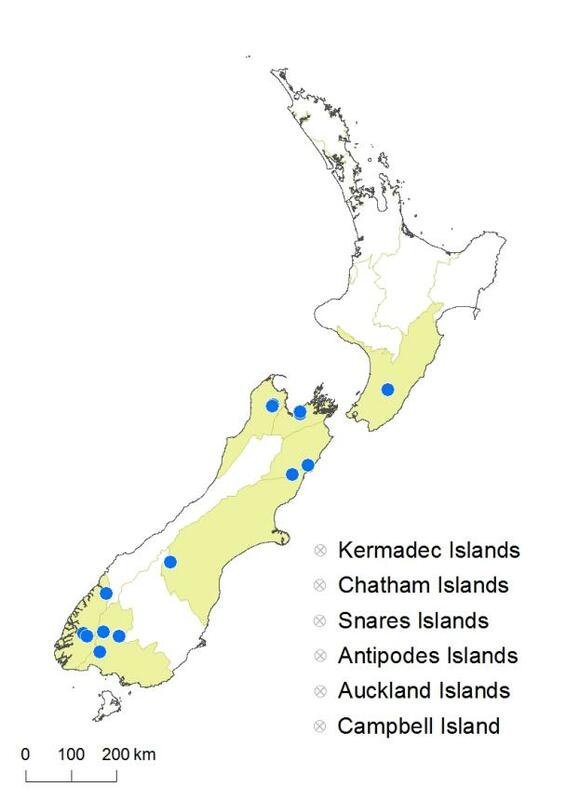 North Island: Southern North Island. 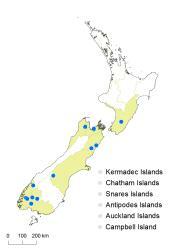 South Island: Western Nelson, Sounds Nelson, Marlborough, Canterbury, Southland, Fiordland. Occurs in a variety of habitats including roadsides, banks, rock outcrops, boggy and swampy areas, depleted pasture, disturbed and regenerating scrub, and grassland. Cunningham (1956, p. 483). Voucher: CHR 70203, 1950. Cunningham, I.J. 1956: Photosensitivity disease in New Zealand VIII. Hypericum pulchrum inactive. New Zealand Journal of Science and Technology 37(Sect. A): 483. Heenan, P.B. 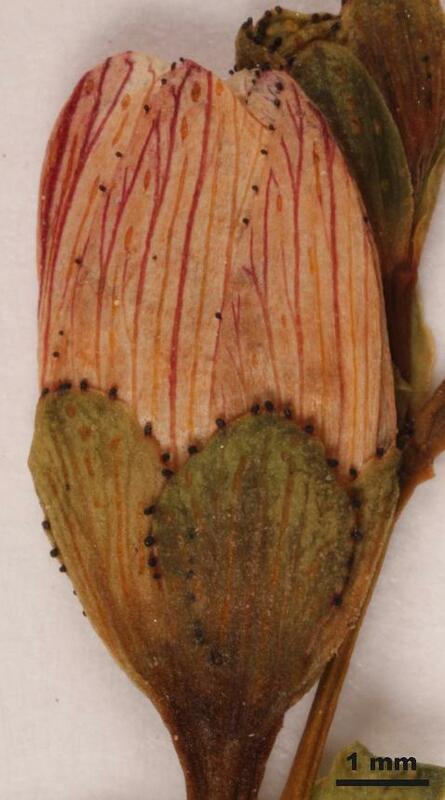 2014: Hypericaceae. In: Breitwieser, I.; Brownsey, P.J. ; Heenan, P.B. ; Wilton, A.D. Flora of New Zealand — Seed Plants. Fascicle 1. Manaaki Whenua Press, Lincoln. 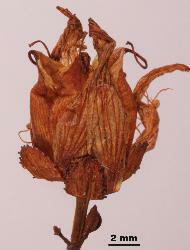 Linnaeus, C. 1753: Species Plantarum. Impensis Laurentii Salvii, Stockholm. Webb, C.J. ; Sykes, W.R.; Garnock-Jones, P.J. 1988: Flora of New Zealand. Vol. IV. Naturalised Pteridophytes, Gymnosperms, Dicotyledons. Botany Division DSIR, Christchurch.